Not much more than a light sweat away from the “Lake of The Sky” are dozens of blue gems that play bit parts to the renowned lake that rides high, wide and handsome in its saddle. If you were midflight between Reno and Sacramento and made the most of your window seat, you’d see glimmers and shimmers in pockets of forest and granite ringing Tahoe. But if you’d rather skip the airfare, pack up a picnic, and take a closer look at one of the area’s most impressive views, then your best choice of transportation is boots. And one of your top destinations is Marlette Lake. Marlette Lake trailheads are anywhere from 45 minutes to an hour from Truckee. 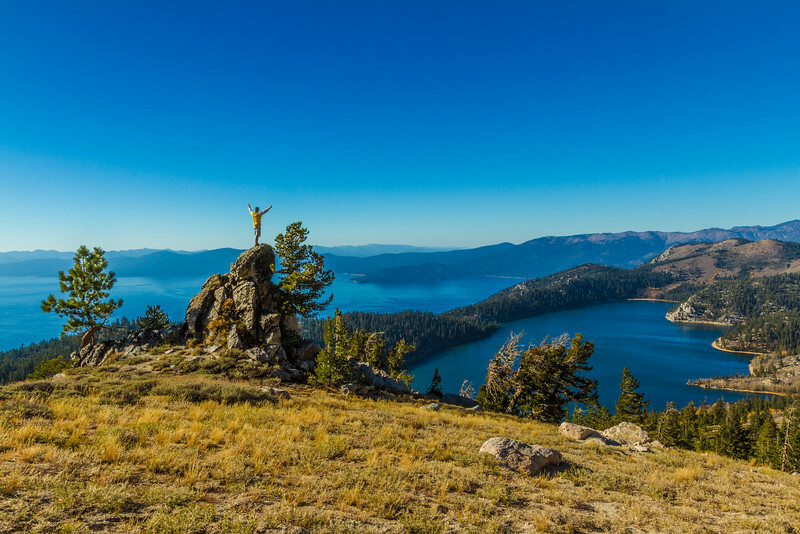 You could opt for the “direct” ascent about five miles beyond Incline or you could savor another 10 or 15 minutes of car time on Route 28 and make your way to Spooner Summit. Although a bit longer, this is the kinder, gentler, more popular trail. It’s also the one we’re heading off on today. At Spooner Lake, you can either park in the state park and pay the $10 day fee or take the short jog left where Route 28 meets Highway 50 and park at the summit. Either route, you’re looking at five miles up and five miles back on a well-packed dirt road that gradually dishes out the 1150 feet of elevation gained. The path (an actual road off limits to public travel) is so moderate and firm that even those armed with Hummer-like strollers can make the journey. Just keep an eye out for the mountain bikers who share the trail with you. 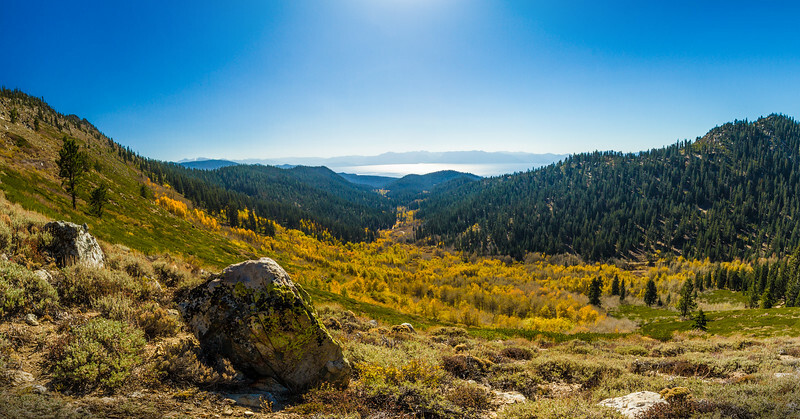 Like most trailheads in the Tahoe basin, summertime is prime time when it comes to hiking Marlette. But Marlette Lake shines every season. Backcountry skiers and snowshoers tackle it and in the springtime (more commonly known as June), flowers that last long into the summer start to bloom. 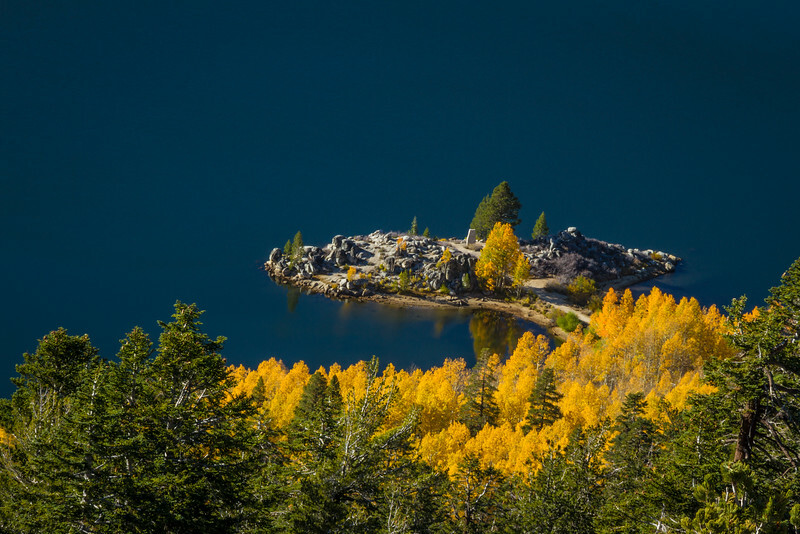 It’s autumn that’s perhaps Marlette Lake’s most impressive season, however. The groves of aspen that generously shade the path through the summer are ablaze in yellows and orange, a stunning contrast to the profusion of evergreens and the deep blue of Marlette Lake. The standard destination is the “isthmus” that juts into the lake and the chimney that makes for a handy photo op. You’re not far from the aspen groves here and on years where the previous winter was heavy or summer’s were wet, you’ll find columbines and Indian Paintbrush blooming under a canopy of autumn. This turnaround point is ideal for picnics and dipping your feet in the lake, but for those interested in a full-frontal encounter with one of the area’s most amazing vistas, you’ll need to eat up, lace up and head up — toward the granite ridge above the east side of the lake. Here, you’ll be rewarded with breathless views to complement your panting lungs. Below is Marlette Lake. Beyond, well you can guess what that big blue stretch is. Walk the ridge a bit and you can eventually line up the optical illusion of Marlette spilling into Tahoe. Or, instead, you can snap your snaps, slug down some water and make tracks for the car some five miles away. The trip back to Truckee is stunning in itself with Tahoe on your port side. If you’ve got kids on board, you may find the return trip pleasantly, contentedly, substantially quieter than it was in the morning. Later that night, under the influence of s’mores and hot chocolate, eyes will again go wide and stories from a day in the ether of Tahoe will be recalled and possibly embellished. Stories that, like the aspens themselves, will grow more colorful with the seasons.